Chronic Dysfunction Found In Death Investigations TV shows often depict forensic pathologists as champions of the dead, solving crimes with high-tech tools and specialized know-how. But the reality of death investigation is much different. A joint Frontline-NPR-ProPublica investigation uncovered pervasive dysfunction in many death investigations. TV shows often depict forensic pathologists as champions of the dead, solving crimes with high-tech tools and specialized know-how. But the reality of death investigation is much different. A joint Frontline-NPR-ProPublica investigation uncovered pervasive dysfunction in many death investigations. A forensic pathologist prepares for an autopsy at The New Mexico Office of the Medical Investigator. Even casual fans of shows like "CSI" and "Bones" understand that real forensic pathologists lack the time and resources of their high-tech TV counterparts. But the scale of the discrepancies is shocking. A joint investigative series by NPR, "Frontline" and ProPublica found a dysfunctional death investigation system in much of the country. Because of the chronic shortage of trained experts, unqualified pathologists continue to practice. Investigators often work with the most minimal equipment and in substandard facilities. In many places, elected coroners with no medical credentials make the final call. As a result, innocent people can end up in prison; murders are not investigated; and potentially serious public health issues go undetected. If you work in the death investigation system - as a coroner, medical examiner or forensic pathologist - call and tell us your story, 800-989-8255. Email talk@npr.org. You can also join the conversation on our website. That's at npr.org. Click on TALK OF THE NATION. Later in the program, Broadway critics rise up against "Spider-Man." But first, Lowell Bergman is a correspondent for PBS "Frontline" and one of the reporters on the "Post Mortem" series. He joins us from member station KNPR in Las Vegas. Nice to have you back on the program. Mr. LOWELL BERGMAN (Producer, "Frontline"): Nice to be here. CONAN: And ProPublica staff reporter A.C. Thompson joins us from our bureau in New York. He also worked on the series. And thank you for joining us today. Mr. A.C. THOMPSON (Staff Reporter, ProPublica): Thanks for having me on. CONAN: Lowell Bergman, many people assume an autopsy is going to be done if a loved one dies unexpectedly. But in reality, in a lot of places, that's just not the case. Mr. BERGMAN: Well, there aren't the funds to autopsy people the way we did in the past, by the way. I mean, hospital autopsies, for example, have decreased from 40 to 50 percent, 50 or 60 years ago, to estimates go from 6 percent to zero today. But forensic pathologists working for medical examiners or coroners - there, too, they have to triage how much they can do. CONAN: In Oklahoma, your series discovered that a lot of - anything categorized as a suicide - well, that doesn't go investigated. If you die over the age of 40, for the most part, you're not going to be - have an autopsy. Mr. BERGMAN: Well, there are triages in place because of funds, the availability of competent forensic pathologists to do autopsies, and it all depends basically on where you die. If you die in New York City, the state of Virginia, Florida, you're likely to get taken care of - or investigated pretty thoroughly. But I can't say the same for the rest of the country. CONAN: And A.C. Thompson, you did a fair amount of investigation in the City of New Orleans and found some particularly egregious examples. Mr. THOMPSON: You know, what's mind-blowing about New Orleans is that over a 20-year span, we found case after case after case where a doctor working for the coroner's office there made what were obvious errors or oversights. So in one case in 2005, a man had an encounter with the police. And when the doctor went to do the autopsy, he failed to note 23 bruises on the man's body, including one that was more than a foot long. And so the death got written up as an accident. Well later, it turned out, after a second autopsy paid for by his family and an investigation by the FBI, that this might have been a homicide, that the police might have killed this man. But you know that if you don't note these bruises all over the man's body, it doesn't look - it looks more like an accident than a fatal beating. And that was the kind of problem that we encountered there. CONAN: And in part because of the mishandling of the case, no one was ever charged. Mr. THOMPSON: In this matter, somebody now has been charged. So one officer has been charged with beating the man to death, and another officer's been charged with allegedly covering it up. And so that case is pending and ongoing. But it took five years for that to happen - and a really remarkable investigation by the FBI - and that was because of the first autopsy. The local DA said: We can't take this case because the first autopsy exonerated these cops. It said that this guy had died in an accident. CONAN: And when that happens repeatedly, with the same investigator, the same pathologist, you'd figure, well, this guy's not going to be working much anymore. Mr. THOMPSON: That's what you would expect. And what we learned is that when doctors make errors or oversights like that, they manage to keep their jobs or move on to another morgue, where they can do autopsies, because there's a dire, dire shortage of these doctors. There are 400 to 500 in the country, and 2.7 million people die every year in this country. So you can see the massive need for doctors to do this work. You can make errors, and you can continue to hold your job. CONAN: And Lowell Bergman, I have to point out, you found a not dissimilar case, a man named Thomas Gill(ph), Dr. Thomas Gill, who seems to bounce from job to job to job. Mr. BERGMAN: Yeah, he went from Indiana, where he was fired, eventually, because he was - he was learning how to do autopsies, actually, on the job. That was about 18 years ago. He did hundreds and hundreds of autopsies a year. The complaints started to mount up, particularly with child deaths - which are particularly difficult to diagnose and figure out - from the parents. And then there was an outcry. He was fired. 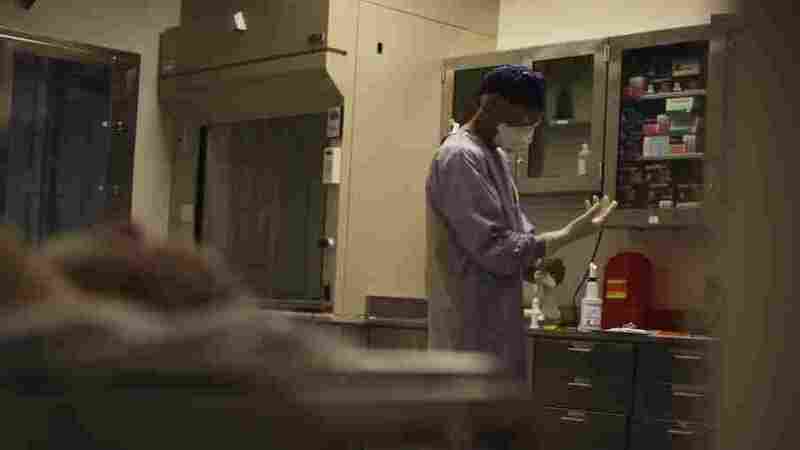 He went from there to Los Angeles, where he didn't do very well, and found a job in Northern California with a private group of forensic pathologists who supply services to 17 counties in Northern California. And there again, he botched an autopsy in a high-profile murder case. That led to someone walking and him leaving town to do it again in Kansas City. And now he's back - where he was controversial - again, and now he's back in Northern California doing autopsies. CONAN: And these sound like, you know, well, aberrations, but in fact -and they're extraordinary stories. I don't mean to say that everybody is like that. But you found case after case in jurisdiction after jurisdiction, where people did not have to qualify for the exam. And in some cases, as you note, the elected coroner does not have a medical degree. Mr. BERGMAN: Well, in Northern California, for example, the coroner is the elected sheriff, and that's true for most of the state. So you're dealing with elected officials in 1,300 counties in the United States, sometimes with the qualifications being a high school diploma - if that. CONAN: We're talking with Lowell Bergman of "Frontline" on PBS, and A.C. Thompson of ProPublica. They worked on the series "Post Mortem." You also may have heard the reports on NPR about the dysfunction in the death investigation system. We want to speak with those of you who have experience there - as coroners, as medical examiners, as well, people who have been involved one way or another with this system; 800-989-8255. Email us, talk@npr.org. Robert's on the line calling from Cape Coral in Florida. ROBERT (Caller): Hello there. Thanks for taking the call. ROBERT: I was involved in a case of a gentleman who was convicted of murdering his infant son, and he was sentenced to life plus 10 years, without the possibility of parole. And part of what had him convicted was that the medical examiner made 26 mistakes on the autopsy. It was a chief medical examiner of Orange and Osceola counties, in Florida. And there were mistakes like saying that the baby was black, when the baby was white; mistakes like saying that he'd examined the heart and taken a slide of heart tissue, when in actual fact, the heart had been taken for transplant before he got the body. And it turned out, when we sent the complaints in, the Florida Medical Examiner's Commission came back and said that this complaint - sorry, this report, autopsy report - had been used in four different cases in Florida. So there were at least three people sitting in jail, in prison, having been wrongly convicted - or at least, having very inaccurate diagnostic information made. We eventually got the medical examiner fired and the conviction overturned. CONAN: Lowell Bergman, you say Florida is, in fact, one of the better places. But nevertheless, mistakes can happen in places like that, too. Mr. BERGMAN: Mistakes can always happen in any profession. The question is, what kind of oversight is there? And there is no national standard for death investigations in the United States. There is no National Institute of Health, for instance, dedicated to setting standards, for doing research in this area. There's no accrediting nationally. You get - hospitals are accredited. The lab that you send your fluids to when you have a - when your doctor sends to - when you have a physical, that's accredited nationally. But the same is not true of death investigations across the country. So it really does depend, what happens, on where you happen to die. And a state line - in one of the stories we tell - can be 100 yards away, and it would make the difference between a building contractor being in charge, or a forensic pathologist at a state medical examiner's office. CONAN: And Robert, thanks very much for the call, appreciate it. A.C. Thompson, I wanted to ask you: A lot of people say wait a minute, what does this matter? These are just investigations for the dead. Mr. THOMPSON: You know, that's the common misconception - is hey, these doctors don't treat the living, so why should we care? And the truth is, is that everything they do affects the living greatly. We're talking about - like the case that was just mentioned, involving Dr. Gorham(ph) in Florida. That's a case where somebody's life gets ruined. They get wrongly convicted. There was a doctor in Canada, Dr. Charles Smith, whose bad autopsies led to numerous people going to prison for killings that they were not responsible for, that they didn't commit. So the living are greatly, greatly impacted by botched autopsies, by poor forensic work in this field. CONAN: And Lowell Bergman, again, if you're routinely not doing autopsies of people over the age of 40, there's going to be an awful lot of - well, maybe not an awful lot of - but actually, nobody knows the number of murders that may slip past you. Mr. BERGMAN: Well, that's one of the areas that we do touch on, which is the deaths of the elderly, which is not something that people look at that often. As we showed in Los Angeles, a man was tortured and buried in the ground. And had there not been a whistleblower and then an autopsy, that would have gone unnoticed. And no one would have checked on one of the best assisted-living - supposedly best assisted-living centers in Los Angeles County. So nursing homes, hospitals, assisted living, deaths at home - these are things that are - the resources aren't there for at least someone to call up or go by, and check out what actually happened. But just let me make sure you understand. For the living, this is a matter of the public health. About 10 percent of what these offices do relate to homicides and suicides. We're talking about detecting epidemics - things like defective products, like cribs. We're talking about things that can only be detected by someone who sees deaths across the community, to see if there's a pattern going on. CONAN: Indeed, that pattern could include suspicious deaths at a certain nursing home or a certain rest home. CONAN: All right. Stay with us, if you will. Lowell Bergman of the PBS series "Frontline"; and also with us, A.C. Thompson of ProPublica. They both worked on the series "Post Mortem: Death Investigation in America." Reports were also aired on NPR News. When we come back, we'll take more of your calls. We want to hear from those of you who work in the coroner's office or the medical examiner's office. What's the problem? What's the story from your point of view; 800-989-8255. Email us, talk@npr.org. Stay with us. I'm Neal Conan. It's the TALK OF THE NATION, from NPR News. CONAN: This is TALK OF THE NATION from NPR News. Im Neal Conan. For the past week on NPR, you may have heard a series of reports that detailed dysfunction in the offices of many of the country's death investigators and coroners. The investigation, dubbed "Post Mortem," was a joint series between NPR, "Frontline" and ProPublica, and you can find a link to the full series at npr.org. Our guests today are Lowell Bergman, producer and correspondent for PBS "Frontline"; and A.C. Thompson, a staff reporter for ProPublica. Both reported for the "Post Mortem" series. If you work in the death investigation system as a coroner, medical examiner, forensic pathologist, call and tell us your story: 800-989-8255. Email us: talk@npr.org. You can also join the conversation on our website. Go to npr.org and click on TALK OF THE NATION. Let's get another caller in. This is Bill, Bill with us from Santa Cruz. BILL: Yes, so I - this is very timely for me. Just last week - I'm a physician in Santa Cruz, and most of the time when someone dies, I have a sense of why they died, especially if they're older and have chronic medical conditions. But just this last week, I had a patient who was transferred care to me in a nursing home, and within a couple of days the patient - the nurses called me and say that the patient was jaundiced. And I, you know, didn't even know why she was jaundiced. So I went and saw the patient, did some laboratory tests, and then waiting for the results - within two days they called me, and said the patient had died. And so I made the referral to the coroner's office, saying, look, I don't know why this happened. I don't know, you know, what to put on the death certificate. And the problem I came across was the - I got a call from the pathologist, who essentially, you know, yelled at me over the phone, maligned my clinical skill, saying he was going to report me to the state board because I refused to sign the death certificate. CONAN: And did they do an autopsy? BILL: As far as I know, they didn't. Actually, the referring physician agreed to sign the death certificate after getting a call from the same pathologist. CONAN: And what's on the death certificate? BILL: I think they just said, you know, died of a heart attack, died of whatever, you know? But they came up with some explanation that pleased the pathologist so the pathologist didn't have to, you know, sign the death certificate. And I told the pathologist, look, you know why the patient died, you sign it. I'm not going to sign it. And that's when it really led to these threats that they're going to report me to the state board. Mr. BERGMAN: Well, we ran into - one of the most startling facts I ran into in California is that in the state of California, it's legal for a doctor to declare what the cause of death is and sign a death certificate if he or she has never seen the patient, never seen the dead body, never investigated. And we present a case like that in the "Frontline" documentary, where this man was tortured, and the doctor signed the death certificate without ever looking at him, and no one reported what went on. The other important aspect of all of this, which people don't really understand, is that when they have tested autopsies versus the cause of death given on a death certificate in hospitals, between 20 and 24 percent, depending on which way you look at it, of the people who died, died of something different than the diagnosis that was made at the hospital or by the doctors. And in 10 percent of the cases, if the treatment - the treatment that was given actually shortened that person's life. So autopsies are the ultimate check on medical procedures, practice and care that we get. And it used to be used, in the good old days, as a way to teach doctors and show them when they made mistakes. Now, by not doing it, those never surface. CONAN: And let me ask - and thanks, Bill, very much for the call, and sorry for your experience. But A.C. Thompson, is this a result of, you know, people just not wanting to do autopsies, or is this a result of people being overwhelmed? Mr. THOMPSON: You know, a lot of this is people being overwhelmed. Old folks definitely get autopsied much, much less than younger people. But you see a situation like Oklahoma - where Oklahoma, the doctors are doing 300 to 500 autopsies a year, which is far, far above the recommended limits. The recommended limits for doing autopsies is about 250 a year. And the professional associations say, hey, if you go above that, you risk making mistakes. Well, in Oklahoma, they have doctors who are doing 500 a year. And they say look, we're missing three forensic pathologists. We need to hire three more doctors. We've got these huge caseloads. So if somebody's 40 years old and drops dead of no apparent cause, we don't have the staff to autopsy them. We're going to assume this is natural; we're going to assume that they weren't poisoned, that it wasn't foul play, because we don't have the staff to do it. And part of what they're missing is what Lowell brought up - is that this could be a situation where somebody is dying of congenital defect at 40, that may be shared by other people in their family, and getting that information could save their family members' lives, you know. And it could also be a case where it is foul play. CONAN: And funding is exceptionally difficult in the state of Oklahoma, but that may not be exceptional anymore. States or counties and cities are cutting funds left and right. Mr. BERGMAN: There's almost no federal funding, for instance, for anything related to this particular practice. Mr. THOMPSON: Right, and we saw massive, massive disparities. We looked at the 69 largest coroner and medical examiner offices in the country, and we saw massive disparities in funding. And some places that you would expect to be well-funded, like Massachusetts, which is a relatively wealthy state, they only spend about $10 million a year to do all the autopsies in the state medical examiner's office for every suspicious death in the state. It's a very low number for the size of the population there. CONAN: Joining us now is Dr. Marcella Fierro, retired chief medical examiner for the state of Virginia. She served in that post for 14 years. She's also co-author of the National Academy of Science's 2009 report that examined the problems in the American forensic investigation system, and she's featured in the "Frontline" documentary, and joins us from member station WCVE in Richmond. Nice to have you with us today. Dr. MARCELLA FIERRO (Retired Chief Medical Examiner, Virginia): Thank you. It's nice to be here. CONAN: And as you looked at the results of this investigation on "Frontline," ProPublica and NPR, were you surprised? Dr. FIERRO: No. No, I wasn't. I was hoping to see more of a focus on systems than on people. CONAN: And as you look at the deficiencies, is a national standard the only way to fix it? Dr. FIERRO: No. I think there are - I think a national standard would help in the sense that if a group of physicians, forensic pathologists, were able to sit down and develop a consensus document as to what ought to happen for A, B, C and D, and this were promulgated throughout the country, it would greatly assist those systems that are striving. It would give them the material they need to go argue for their budget and staff and facility. It would set a standard that would be useful for peer review, and would reassure the public that there is some serious thought going on to how to improve death investigation. CONAN: You say some of those systems that are striving - which is, I suppose, a nice way to put it. There appear to be any number of systems where there is structural incompetence. Dr. FIERRO: I think there are problems that you can identify as problems of code. In other words, their state statute is so constructed that they aren't able to do a good job. And then there are problems of staffing. How do you find, how do you keep, how do you train, and how do you supervise the staff that you need? There are problems with funds, so that in fact if you wish to autopsy all suicides, you would be able to do that because you have a morgue that can handle the case load, the autopsy techs to assist, the toxicology to support and, you know, a facility that will help you. So all of these things are related to funding levels. But there's also another major issue, and that's one of policy. Does the jurisdiction desire to have an improved death investigation system? And if it does, what is it willing to do to achieve it? Is it willing to -say, if there were several rural counties or low-population counties, are they willing to cooperate and regionalize, to share a facility, share the budget for that facility, and so forth. So there are lots of things that need to be considered if you want to improve things, not the least of which is policy. CONAN: Lowell Bergman, from your documentary, and from the other parts of the series that we've heard and read, it seems like - well, that's as far away as the moon. You've got entrenched political systems that are going to be almost impossible to dislodge. Mr. BERGMAN: We were amazed at the patchwork system nationally. You know, from - I think like many people out there, as journalists, when we thought of death investigations, we have these different little stories that we tell each time. And what we - and we've tried to figure out a way of understanding this nationwide. And understanding it - is that it is a jumble, really, of different jurisdictions, different places, different rules, different state constitutions and overall, a really big shortage of people of the competence of Dr. Fierro, for instance, practicing. CONAN: Let's get Bill on the line. Bill's calling us from Charlotte. BILL (Caller): Yes, this is a great show. Thank you very much for bringing this to the forefront. I agree with everything that's been said. I'm a surgical pathologist and practice in a large, community hospital system. I had forensic experience when I was in the military in Germany, as part of the military medical examiner system. And before I went to Germany, I was required to take extra rotations in forensic. And then any forensic cases we did had to be under the direction of a board-certified forensic pathologist. I think the one thing that's been touched upon is the fact that autopsies have fallen so out of favor in routine medical practice, and I think this is not just restricted to medical examiner offices. I think it begins in our teaching centers. When I finished my residency in 1984, I was required as part of that four-year residency to have performed 100 autopsies - again, supervised - and I had to turn in those autopsy reports to the American Board of Pathology in order to be able to sit for my just general pathology boards. So I think this is something that starts in our training centers. It's fallen way out of sync. And I believe that just by starting with the basic attempts to reinstitate(ph) - excuse me, reinstitute autopsy protocols in our teaching centers, we can go a long way, then, towards having pathologists be better trained. And then before they advance into their forensic fellowship, they do a better job in the future. And, again, thanks for bringing this to the forefront. CONAN: And thanks for the call, Bill. I wonder, Dr. Fierro, if you would agree. Dr. FIERRO: I would agree. I think pathology residents do not have sufficient exposure to the autopsy during their training to really develop a sense of how interesting it is to do them, and how much information can be gleaned. Autopsies are very labor-intensive, and hospital laboratories are really more used to, these days, high-batch processing of laboratory studies and surgical specimens. The autopsy requires a concerted time interval of effort, and then additional effort to do the microscopic slide work, and then to correlate the findings. It's really the difference between multiple choice and a term paper. So they're very labor-intensive, and young residents don't have an opportunity to experience the intellectual stimulation that you get out of sorting out why somebody died, and then putting that into a meaningful format for others to use. CONAN: A.C. Thompson, your series points out that as challenging, interesting and as important as all that work is, it takes extra work to qualify, to become a board-certified pathologist. And it doesn't pay as well as other parts of the medical profession. Mr. THOMPSON: You know, that's what kept coming up over and over again -is doctors would tell us, you know, I'd love to do this work, but I would be working in a publicly funded system that's publicly underfunded, and I would be getting paid far less than I could working in a hospital. We heard that over and over again. We - you know, honestly, I didn't hear people saying, this is kind of morbid work, or I'd like to treat the living. I think a lot of people think hey, this is really cool work. It's really beneficial to society. But I have huge debts to pay. I'm a new doctor, and I can't take a big pay cut to go into this field. CONAN: A.C. Thompson and Lowell Bergman worked for their respective organizations, ProPublica and PBS "Frontline," on the series: "Post Mortem: Death Investigation in America." Also with us, Dr. Marcella Fierro, retired chief medical examiner for the state of Virginia. And we have this email from John(ph) in Cincinnati. I have handled three class-action cases against coroners for the unauthorized taking of human body parts. I had the first case, Brotherton versus Cleveland M.D., in 1991, to hold that there is a constitutional right to your loved one's dead body. Recently, the coroners associations have politically fought this and have succeeded in two cases, which absolved them of any liability for taking and destroying body parts - e.g., brains, hearts, eyes. The courts have now held in Ohio and Michigan that we have no right in - our loved ones' bodies until after the coroners are done and determined what, if anything, they wish to return to us. The coroners are arrogant in thumbing their noses at the law and our fundamental rights. I wonder if I could get a reaction from Dr. Fierro. Dr. FIERRO: Wow. I think the issue is not quite as simple as presented. In the course of performing autopsies, there are sometimes questions that can't be answered unless tissue is retained and studied later, and brain, of course, is one of those. The brain itself is so soft that it can't be handled well. If there is a desire to actually make a diagnosis on a brain disease, that tissue will need to be preserved. Now, you have the option - you can retain the body for two weeks while the tissue is preserved, and then you take the sections and make the diagnosis; or return the body and retain the brain; or tell the family, you know, we have retained the brain. We can return what we have not studied to you in - you know, two weeks plus two weeks - in a month's time, or we can cremate it in a respectful manner. And generally, the tradition has been to follow the last: to retain the tissue, to take what is needed for study, then cremate the remainder of the tissue in a respectful manner. CONAN: Respectful manner - the emailer was complaining about arrogance, saying, you know - well, obviously, we don't know the cases involved. And clearly, they did not involve you. But is it possible that this is being treated brusquely? Dr. FIERRO: You know, I wouldn't even begin to comment on interpersonal relations between the lawyers and offices. CONAN: All right. With us is Dr. Marcella Fierro. And we're also talking with A.C. Thompson and Lowell Bergman, who investigated for the series "Post Mortem: Death Investigation in America." And Lowell Bergman, one of the things you talked about was the idea of federal standards and hearings may be in line at the Senate Judiciary Committee. But it doesn't sound like federal standards are anywhere close to being imposed. Mr. BERGMAN: Well, at least - I understand that there are various discussions going on in the National Institute of Health and other places to, at least, bring up the question of studying what needs to be done. And there is some legislations pending - primarily, I think, related to crime labs and forensic science in general. But I would say this - that we all learned when this is important, when there are national tragedies related to death, and become aware of the difficulties in the system at that time. And I think it's - for example, we know in the O.J. Simpson case that it was a failure of a proper death investigation that led to an apparently guilty man walking. We know in the John F. Kennedy case, which resulted in all kinds of conspiracy theories, that it was the lack of the preservation of some of his body parts that led to conspiracy theories that haunt us today. CONAN: More on the investigation into dysfunctional death examinations in a moment. Plus, reviews are out for the most expensive musical in Broadway history: "Spider-Man: Turn Off the Dark." Reviewers suggest "Spider-Man," turn off the lights. Stay with us. I'm Neal Conan. It's the TALK OF THE NATION from NPR News. CONAN: Right now, we're talking about the NPR investigative series "Post Mortem: Death Investigation in America." As we've heard, bodies have been accidentally cremated or lost altogether. Bullet holes in victims have been missed during exams. In some cases, people have gone for - to jail for crimes they did not commit, while others never faced charges. We've posted links to the full NPR, Frontline, ProPublica series at npr.org. If you work in the death investigation system, give us a call: 800-989-8255. Or email us: talk@npr.org. Lowell Bergman is with us from Frontline; A.C. Thompson, from ProPublica. Also with us, Dr. Marcella Fierro, retired chief medical examiner for the state of Virginia. And here's an email that we have from Martha(ph) in Sacramento: My mom died in a nursing home. And by that time, I knew she had been neglected and abused. It took me several hours to learn the coroner would not pick up from a nursing home; several days to learn they would not do an autopsy on my mom. I was referred to a local university hospital and a few days later, was told they would not do the autopsy, either. The coroner referred me to a private pathologist who was off work ill, and his staff was backlogged. By the time the autopsy I paid for was completed, I was told the results were compromised because of the time delay. What I do know is Mom suffered from malnutrition, dehydration, overdose on iron and seven preventable infections, including - well, I'm not going to read all the infections. She also suffered from unreported fall and from pressure sores. And I wanted to ask Dr. Fierro: This is the kind of autopsy that had it been performed, kind of investigation that had been undertaken, might have uncovered not just this case but a pattern of cases. Dr. FIERRO: Certainly, in the elderly, there's sometimes the question of neglect in the setting where they are, and that can be - it's important for a community to know that. But most of these patients have longstanding disease. They have multiple possibilities for cause of death. If the death is not reported to the medical examiner, and if there is not some information that would suggest that there was neglect at the setting, then the medical examiner is not likely to accept that case. Now, there's still options for the family, you would hope, and one of those is to engage a private pathologist to carry out the autopsy - or the university. And in this lady's instance, they both failed her. There is not a good system for the private autopsy. Universities, because they've cut down on the number of autopsies that residents perform, are unwilling, often, to accept cases for autopsy unless that individual has been a resident in the hospital - patient in the hospital at the time of death, or the clinicians in that particular hospital are anxious to have an autopsy. CONAN: And A.C. Thompson, it's probably fair to point out that every complaint about autopsies not performed or that may have come to the wrong conclusions - well, families have known to insist that what the facts are, are indeed not the facts. Are you there? No, I'm sorry. A.C. Thompson is apparently not with us any longer. A.C. Thompson was with us from our bureau in New York. Lowell Bergman, can you comment on that? Mr. BERGMAN: Well, I'm reflecting on, for example, a pathologist in a major city who wanted to stay off the record, who told us that he would often refer infectious diseases to the local medical examiner in that state. And they weren't interested, and he was shocked. And this is a state that's had regular problems in terms of funding and its ability to do autopsies. And it seems that it's not that - it's very difficult also for - we ran into a number of families, like the story we just heard - for a family, at the time of death of a loved one, to try to figure out what to do; and whether or not they have the funds, for instance, to retain a private forensic pathologist to do an autopsy. In some of the New Orleans cases that you'll see in the documentary and that have been in the NPR series, the families did have the resources to pay for a second autopsy. And in fact, in that town, as Mary Howell, a local civil rights lawyer, says, they normally do do second autopsies -which apparently, is unusual - just because they know that when people are in custody, they've gotten such varied results from the coroner's office. CONAN: How much does a private autopsy cost? Mr. BERGMAN: The figures we ran into are between 1,500 and $2,000. But Dr. Fierro might know better. Dr. FIERRO: No, I think that's a fair assessment. But I would like to address that question about the infectious disease. The medical examiner is not the autopsy doer of last resort. When does an infectious disease case become of significance to the medical examiner? When it's not diagnosed yet; when there is a suspicion of infectious disease that could represent a hazard to the public health. And this could be the death so quick, that meningitis - an infectious meningitis could not be excluded. The medical examiner will take that case. If the individual dies in the hospital after the meningitis has been diagnosed and the culture is established, the medical examiner will not take that case, because there is a public health system that will pick up that case from the hospital. It does not need the intervention of the medical examiner. If autopsy is to be carried out, it should be carried out with the permission of the family, at the hospital. But if you call and you say, we suspect this is a meningitis in a college student, or we suspect this might be tuberculosis in a prisoner, the medical examiner will take that case in a flash because there is big public health import there. In a closed population, tuberculosis is very dangerous. In a college campus, a case of meningitis is very dangerous. Dr. FIERRO: But if the case is already diagnosed and the appropriate studies done, there is no need, then, for the medical examiner to bring the power of a medicolegal death investigation to that case. CONAN: One more email, this is from Anjette(ph): My husband is a pathologist. And while it's true that there are few forensic pathologists in one - in the country, there are many pathologists. Most hospitals have at least one, and the larger ones have several. Every pathologist can do autopsies, but they just aren't profitable. No one wants to pay for them. Because we're in the military system, the opportunities for autopsies are a bit different. For every person who served in the military, the option of an autopsy is offered, regardless of age. And Dr. Fierro, might that be the system that might be best for everybody if that's what the military gets? Dr. FIERRO: Well, I think hospitals complain bitterly that autopsies -hospitals and pathology departments complain bitterly that they are not properly compensated for autopsies. They are an expensive endeavor, and they are labor-intensive. If the costs were more equitably compensated, I think hospitals and pathologists would be more willing to do them. CONAN: As a teaching tool. Dr. FIERRO: ...for their young doctors. But absent that, it's difficult to get a private autopsy. They need to improve the compensation for them. Nobody expects a surgeon to do a gallbladder for, you know, for free. CONAN: Dr. Fierro, thanks very much for your time today. We appreciate it. CONAN: Dr. Marcella Fierro, retired chief medical examiner for the state of Virginia, served as chief there for 14 years. Prior - for that, was deputy chief for 17, and is featured in the PBS "Frontline" documentary "Post Mortem: Death Investigation in America." And correspondent and producer Lowell Bergman was also with us from KNPR, our member station in Las Vegas. Lowell, thanks again. Good luck with the piece. CONAN: And you're listening to TALK OF THE NATION, from NPR News.